Hi lovelies! 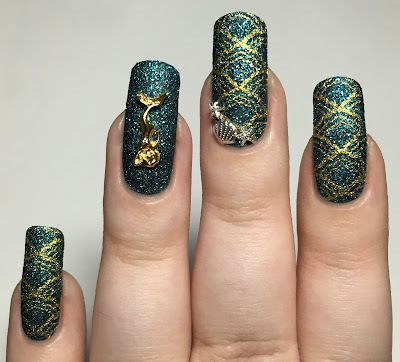 Today I have some fun nail art to share with you - a textured mermaid mani. Now this might not seem like the most seasonally appropriate theme, and it's not festive (at all) but it just sort of happened! I originally intended just to swatch the base polish, and I got carried away and ended up with this. Read on to find out more! I started off with a base of Avon 'Turquoise' Mineral Crush. The gorgeous Lou (@2110lola over on Instagram) kindly sent this to me, and I had to put it on straight away. I've never tried an Avon polish before but I really like this! It is a texture but didn't feel at all gritty during application. Below is two easy coats without topcoat. This screamed out for mermaid nail art. I pulled out my stamping plates and settled on a wavy scale pattern on MoYou London plate Sailor 05. 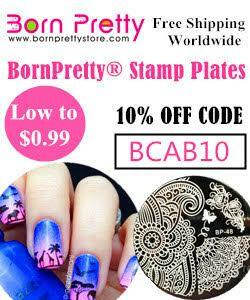 I stamped onto my index, middle, and pinky nails using my Born Pretty Store clear stamper and bright gold stamping polish. I then finished off by adding some nail charms, also from Born Pretty Store. I added a large gold mermaid to my ring finger, and some silver shells and starfish to my middle finger. And there we have it! After a while, I decided to add a topcoat to see the difference. It really deepens the colours, and brings out the sparkle of the base polish. What do you think? Do you prefer it with or without topcoat? I think before topcoat wins for me, I love a good texture! I'm also really impressed with the mani itself. Sometimes the best ones are those that end up being made up on the spot - at least for me anyway! 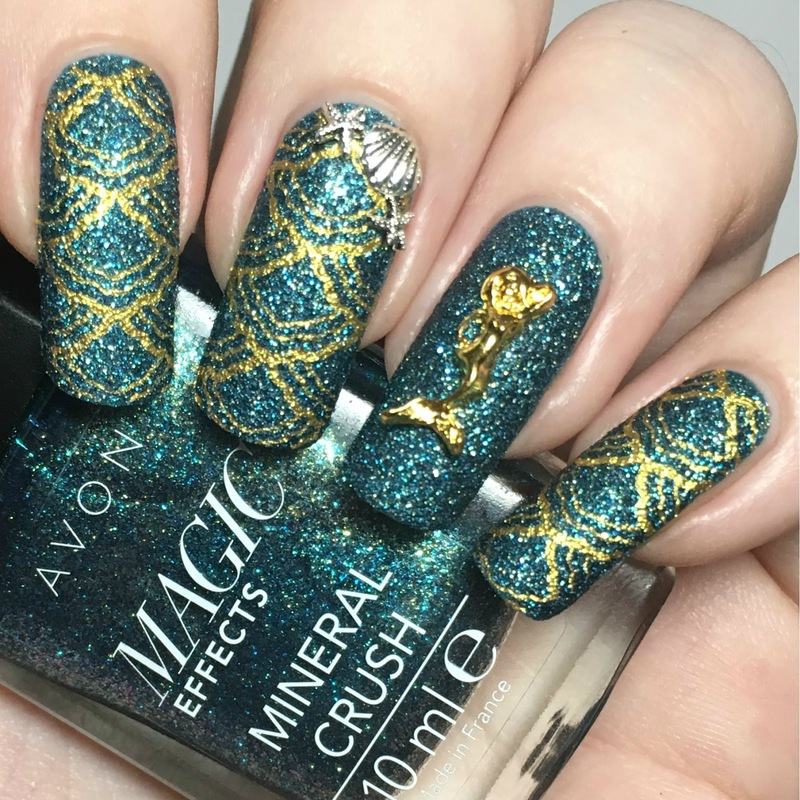 I loved textured polishes a couple years ago but then got over them. This is a great idea for using them up! I loved that you used textured polish, and that you used gold! 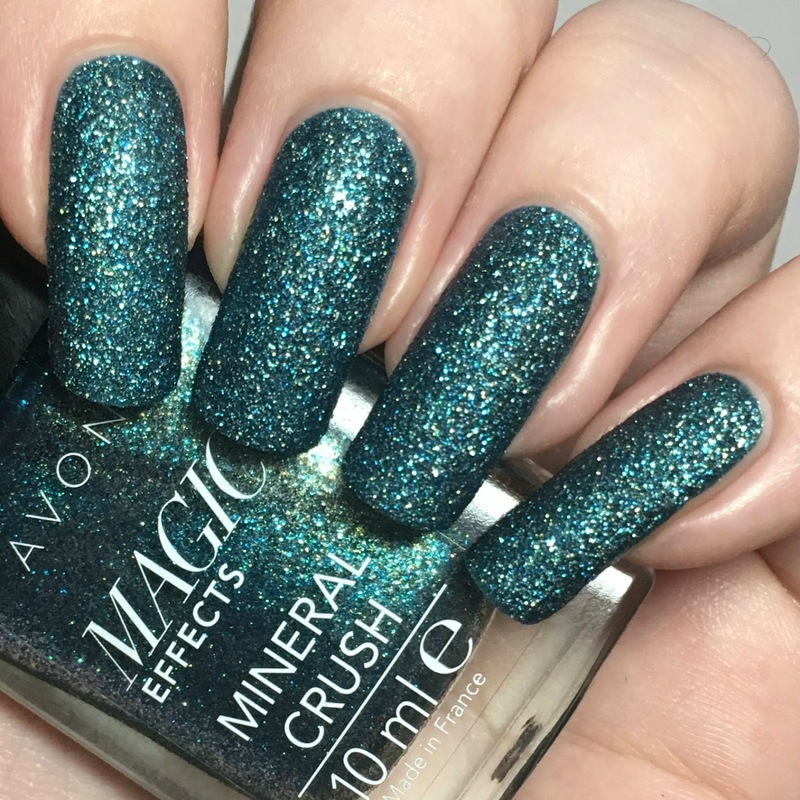 Most mermaid manis are blue and silver, and this makes a lovely change. I am a fan of textured polishes when they are good. This is used beautifully!! I like the no top coat version. It feels more organic and as if it came from a grotto. You always come up with great ideas. I like it shiny since mermaids are definitely shiny. wow i love these! the color is stunning! I love this! I have yet to try any nail art with textured polishes, but I love the look. That's a gorgeous mani! Now I'm trying to remember if I have that Avon! That is one of my favorite stamping plates of all time!